What to essential clothes do you need for your baby? Baby Care Expert Rachel Waddilove has compiled a quick, simple and comprehensive list of essentials baby clothes. When shopping for clothes for your newborn, make sure they are washable, don't need ironing and are made from soft fabric such as cotton or terry towelling. You will find your baby grows out of newborn-size clothes very quickly, so it's a good idea to buy most clothes in 0-3 months size. With the help of this list, you'll be able to relax, happy in the knowlege that you have all the essential baby clothes for your baby for the first three months! 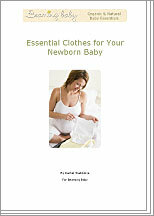 An excellent, practical list of essential clothes for your newborn baby, Download Now!